Free Delivery on all UK Mainland orders over £ 75.00! 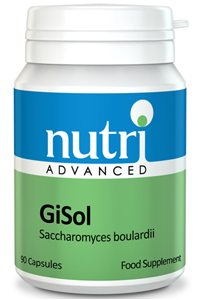 Nutri Advanced GiSol is a Saccharomyces boulardii supplement. 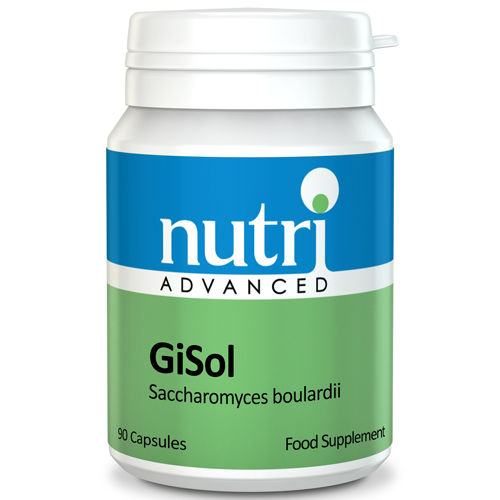 Saccharomyces boulardii is a non-pathogenic yeast. Two capsules daily, or as directed. Encapsulated with: Ascorbic acid, Gelatin, Mannitol, Magnesium stearate, Silicon dioxide, Natural vanilla flavour. Must not be taken by organ transplant recipients. Not suitable for patients with a weakened immune function (immunocompromised). If pregnant, breastfeeding, taking any kind of medication or have a medical condition, consult a healthcare practitioner before using this product. Contains ingredients derived from milk. Supplements should not be used as a substitute for a varied diet and healthy lifestyle. Results may vary between individuals. Please note: due to continuous design updates by manufacturers, the product supplied may not exactly match that pictured.